[Introductory Note to Readers: Readers may find it helpful to know two points about Dr. Sartori's article. - The acronym ”ITU” refers to an Intensive Therapy Unit which, in the United Kingdom, is the equivalent of an Intensive Care Unit in North America. At the time of commencement of this study, most NDE research was retrospective (Moody 1975, Ring 1980, Sabom 1982, Morse et al., 1985). A similar study (Parnia et al., 2001) was commenced at the same time as this study and followed a similar protocol, both projects being supervised by Dr Peter Fenwick. Further prospective studies have since been published (Parnia et al., 2001, van Lommel et al., 2001, Schwaninger et al., 2002, Greyson 2003). The aim of this study was to establish if reductionist arguments of anoxia, hypercarbia or drug administration could explain the NDE. It was attempted to verify the out of body component by placing brightly coloured symbols (which could only be viewed from an out of body perspective) on top of the cardiac monitor at each patient’s bedside. The pilot study was undertaken during the summer of 1997. The official data collection began in January 1998 and was completed in January 2003. If it was apparent that a patient had undergone a NDE or OBE they were interviewed in-depth once the research had been explained and their written consent obtained. They were allowed free narrative of the experience and then completed The Greyson NDE Scale (Greyson 1983). This was followed by an in-depth questionnaire based on that used by Ring (1980). It was also evident that many patients had reported hallucinations. Twelve of these cases were documented in order to contrast the differences between NDEs and hallucinations. Drugs administered and the blood results taken at the time of the medical emergency were documented and later analysed. Penny Sartori has worked as a nurse at The Intensive Therapy Unit, Morriston Hospital, Swansea, UK for the past 13 years. The frequent deaths of patients she encountered made Dr. Sartori question 'What happens when we die'. She read about NDEs and in 1997 decided to undertake her own research by conducting a long term prospective study (the UKs first long term study). The supervisors for the research were Dr Peter Fenwick and Professor Paul Badham. 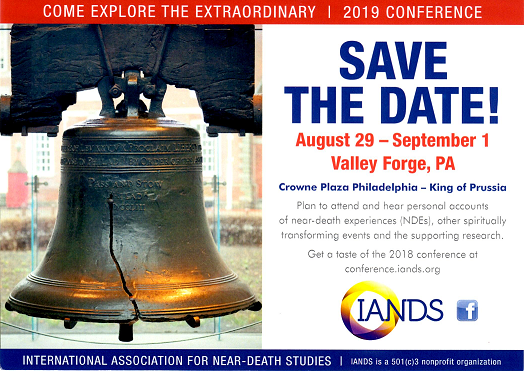 The prospective study formed part of a much bigger research project into NDEs for which Dr. Sartori was awarded a PhD in 2005 at the University of Wales, Lampeter. "Reprinted with permission of the Network Review, published by the Scientific and Medical Network (www.scimednet.org )." There were a total number of 243 patients in this sample. 2 patients reported a NDE (one NDE occurred during cardiac arrest). 2 patients reported an OBE from this sample. These OBEs occurred independently of NDEs. There were 39 patients in this group. 7 reported a NDE and 32 had no recollection of their resuscitation. 2 patients reported OBEs. NDEs = 15. These included the 7 NDEs which occurred during cardiac arrest, 2 were spontaneously reported and 6 were reported by patients who came very close to death. OBEs = 8. 5 occurred as part of a NDE, 2 occurred without other elements of a NDE and 1 was a mind model constructed from residual sight and tactile stimulation when recovering from anaesthetic. There was no apparent influence of the demographic data. This sample was only representative of Welsh people; hence no diversity of culture. The reports were, however, consistent with other documented British NDEs. It is apparent that NDEs are not wishful thinking as some experiences did not meet the expectations of the patient and two NDEs were unpleasant. One of the most significant findings of this research was that the closer one comes to death, the more likely it is that a NDE will be reported. The total number of patients who survived ITU (not all of whom came close to death) were compared with cardiac arrest survivors (those who had been clinically dead for a period of time). It was discovered that there was a much higher frequency of NDEs among cardiac arrest survivors. In comparing heart rhythms among cardiac arrest survivors, it was also discovered that the rhythm most prevalent in the NDE group was asystole — a rhythm associated with the highest fatality. None of the OBErs in this study viewed the hidden symbols placed on the monitors. However, this study has shown that one patient reported a very accurate OBE during a period of unconsciousness. The other OBErs also reported accurate descriptions but these were not verifiable and could have been viewed from their position in the bed. When contrasted with the control group, who had undergone resuscitation but did not report an OBE, many discrepancies were discovered. Having been asked to re-enact their resuscitation, the control group’s reports were very inaccurate and demonstrated misconceptions and errors between the actual procedures performed, as well as equipment used. Many of these patients either had no idea as to how they had been resuscitated or made guesses, based on what they had previously seen on television. Some NDEs reported in this study differed slightly from those reported in the literature. Except for the two deepest NDEs (Patients 10 and 11), they lacked the narrative quality and the patients did not appear to attach any significance to them or didn’t understand them. This suggests that there could be a sub-set of NDErs who have fragments of the NDE, but do not think about it again unless asked. It is likely that the NDE is an under-reported phenomenon. Only two NDEs were spontaneously reported to members of staff. These were deep NDEs, as they incorporated many of the NDE elements, and the experiences had sufficient impact to motivate the individuals to relate the experience to others. The remaining thirteen NDEs would not have been disclosed had the patients not been interviewed. Under-reporting is further supported by three patients who reported a NDE, yet died very soon after. It is possible that patients, who briefly recover from a life threatening illness, may have experienced a NDE during the acute phase of their illness but do not regain their health sufficiently in order to report it. This study has shown that very few NDEs were elicited from the total sample, the majority of whom were given painkilling and sedative drugs. If drugs were the cause of the NDE then a larger percentage of NDEs would be expected. There were also cases in which some experiences similar to NDEs became very confusional once painkilling drugs had been administered. Similarly, a patient was unable to recall an experience he had previously related to his visitors following a further period of sedation in response to a deterioration of his condition. All patients (except one patient who was suffering from sleep deprivation) who reported hallucinations had been given a combination of large amounts of sedative and painkilling drugs. Comparison of the NDEs and hallucinations reported has highlighted the differences between the two types of experiences. Whereas the NDEs followed a pattern, the hallucinations were very random, bizarre and related to actual occurrences and the actions of members of staff. On follow-up, those who had reported hallucinations could rationalise that they had been hallucinating, whereas NDErs remained adamant that their experience was real. Further unexplained aspects of the NDE, such as meeting deceased relatives who were not known to be dead at the time of the experience and gaining information in ways other than through the senses, could not be explained by physiological or psychological factors. Having examined all aspects of the NDE, the phenomenon remains unexplained when considered from the current scientific perspective of consciousness being a by-product of neurological processes. This small study has suggested that NDEs occurred during unconsciousness in two of the patients and has contributed to the growing body of research in this area. The fact that clear, lucid experiences were reported during a time when the brain was devoid of activity (Aminoff et al., 1988, Clute and Levy 1990, de Vries et al., 1998), does not sit easily with current scientific belief. Cases in which blood was extracted at the time of the NDE / OBE did not support the anoxia or hypercarbia theories. The drugs administered to the patients appeared to inhibit rather than cause the NDE. It must be noted that the sample is too small to be statistically significant; however, the combination of all data from recent and retrospective research provides a large amount of evidence, which can no longer be ignored or explained away. Current reductionist arguments are not supported when this phenomenon is examined in the clinical area. It is therefore essential that further research is conducted in order to establish a wider explanation of the NDE. This prospective study formed part of a much larger research project into near-death experiences for which the author was awarded a Ph.D of the University of Wales, Lampeter in 2005. Sincere thanks to Dr Peter Fenwick and Professor Paul Badham for supervising the research, and to my colleagues at the Intensive Therapy Unit, Morriston Hospital, Swansea for all their help and support over the past 8 years. Sincere thanks also to The Lifebridge Foundation, New York for funding my university fees. Aminoff, M. J., Scheinman, M. M., Griffing, J. C. and Herre, J. M. (1988). Electrocerebral accompaniments of syncope associated with malignant ventricular arrhythmias. Ann. Intern. Med. 108: 791-96. Clute, H. L. and Levy, W. J. (1990) Electroencephalographic changes during brief cardiac arrest in humans. Anaesthesiology. 73: 821-25.
de Vries, J. W., Bakker, P. F., Visser, G. H., Diephuis, J. C. and van Huffelen, A. C. (1998). Changes in cerebral oxygen uptake and cerebral electrical activity during defibrillation threshold testing. Anesth. Analg. July; 87 (1): 16-20. Greyson, B. (1983). The Near-Death Experience Scale: Construction, reliability and validity. Journal of Nervous and Mental Disease, 171: 369-375. Greyson, B. (2003) Incidence and correlates of near-death experiences in a cardiac care unit. General Hospital Psychiatry, 25: 269-276. Moody, R. A. Jnr. (1975). Life After Life. New York: Mockingbird/Bantam Books. Morse, M, Conner, D. and Tyler, D. (1985). Near-Death Experiences in a Pediatric Population. American Journal of Diseases of Children, Vol. 139, pp. 595-600. Parnia, S., Waller, D. G., Yeates, R., Fenwick, P. (2001) A qualitative and quantitative study of the incidence, features and aetiology of near death experiences in cardiac arrest survivors. Resuscitation 48: 149-156. Ring K. (1980). Life at Death: A Scientific Investigation of the Near-Death Experience. New York: Coward, McCann and Geoghegan. Sabom, M. (1982). Recollections of Death: An Investigation Revealing Striking New Medical Evidence of Life After Death. London: Corgi. First Publication in Great Britain. Schwaninger, J., Eisenberg, P. R., Schechtman, K. B. and Weiss, A. N. (2002) A Prospective Analysis of Near-Death Experiences in Cardiac Arrest Patients. Journal of Near-Death Studies. Summer, 20 (4), pp. 215-232.
van Lommel, P., van Wees, R., Meyers, V. and Eifferich, I. (2001) Near-death experience in survivors of cardiac arrest: a prospective study in the Netherlands. The Lancet, Vol. 358, pp. 2039-2045, December 15th. This article was originally published by Scientific and Medical Network , an interdisciplinary forum exploring the frontiers of science and spirituality.